When I first started this blog for my MA in International Journalism I knew that one of the areas I really wanted to cover was the impact of Caribbean people on British politics. As a child of the ’90s I was acutely aware that in 1987 the first four Black MPs to serve in the House of Commons had been elected including the first Black female MP Diane Abbott who is of Jamaican descent. As I dug deeper I was surprised to find that these trailblazers were actually preceded into public office by two members of the House of Lords, Sir Learie Constantine and Lord David Pitt, and that they had followed Dr Allan Glaisyer Minns who had become the first person of Caribbean descent ever elected to public office in the UK as far back as 1903. But I guess Diane Abbott stands out from this group because she was the first Black female MP so when I started this blog I really wanted to talk to her about her experiences not just as an MP but as a Black Briton. Unfortunately Ms Abbott did not get back to me and I am still waiting for any sort of reply. 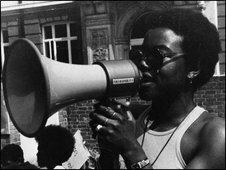 However this week I read that she had given an interview to the BBC’s Witness programme, during which she talked about her political career and what it was like to be the first Black female MP, and if you can take a listen I recommend it – BBC witness: Britain’s first Black woman MP.